Italian Round of RX Lites challenge has ended with a tremendous action. High tempo and excitement was never lowered down starting from the very first race of the weekend. 12 drivers entered to 5th round of 2014 season. RX Lites fans have met regulars and also some new names who appeared on the grid for the first time. Daniel Holten was the name of the victory in Italy. After scoring some points in the first three rounds he didnt entered in HÃ¶ljes, since he was driving a SuperCar there. But he made an unfergetable comeback to RX Lites as he drove his car on the lead from the very first lap of the final race. This first win of the season let him to climb up to 3rd place on overall standings. Kevin Eriksson came to Italian soil to defend his lead. He was also hoping to extend the point gaps and guarantee his first ever season win even before the last round. Kevin steered his RX lites to the top three finishes in all Heats and semi final race in order to secure some more points. Finally he finished the weekend on the second position and moved his points to 116 which is more than enough for his 2014 season win. Kevin Hansen Jr, started to dominate the weekend even from the first Heat. He won the first three Heats but on 4th he stuck outside the road after colliding Simon Olofsson. 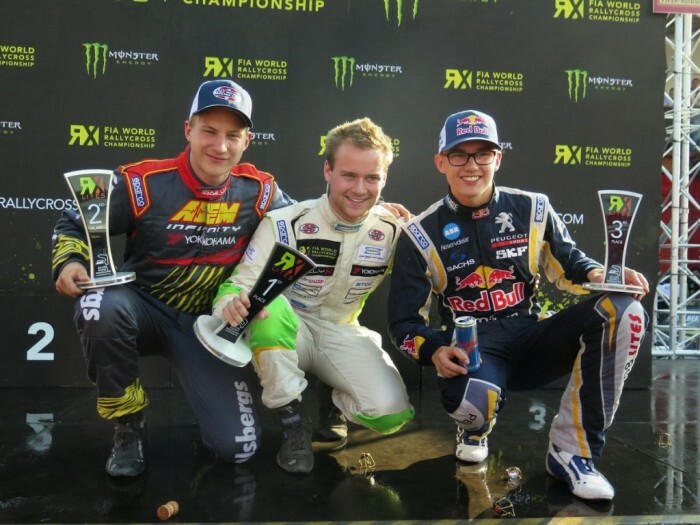 This result didnt effect him to join the semi finals but as he couldnt score the points he aimed, it was not enough to keep Eriksson from his season win. As he won the semi final race 2, he jumped to final race easily. But stucking in the traffic right after start, he couldnt managed to pin himself to lead but finished the round in 3rd place and now he is at the second place in overall standings. Piero Longhi surely was the name of the weekend who was cheered the most by thousands of fans in Franciacorta Circuit. Italian Rally Champion has added a lot of colours to the weekend and after some breathtaking moments he clinched his name on the 4th position at the final race. Yigit Timur struggled in some of the heats and dropped down to bottom lines on Intermediate Points. He pushed hard on Heat 4 and climbed up to 8th. Young Turk managed to finish the first semi final race on second place but he could only finish the weekend on 5th place as he struggled with some power loss on his engine. Turkish Rally driver Fatih Kara completed the final race after finishing 6th overall on his first ever RX Lites experience. He surely is taking some precious data to his home soil where the next round will be held. RX Lites fans know who will be driving the SuperCar in Argentina, Kevin Eriksson. But who will have the chance to get the opportunity on full day test session at the steer of a SuperCar. The answer will be unfolded on the next and the final round of 2014 at Intercity IstanbulPark Circuit in Istanbul, Turkey.